Simpe and very delicious walnut bread. Serve it with a good slice of cheese and some homemade jam. I love bread and I love to experimenting in the kitchen to come up with new and interesting recipes for new types of bread. 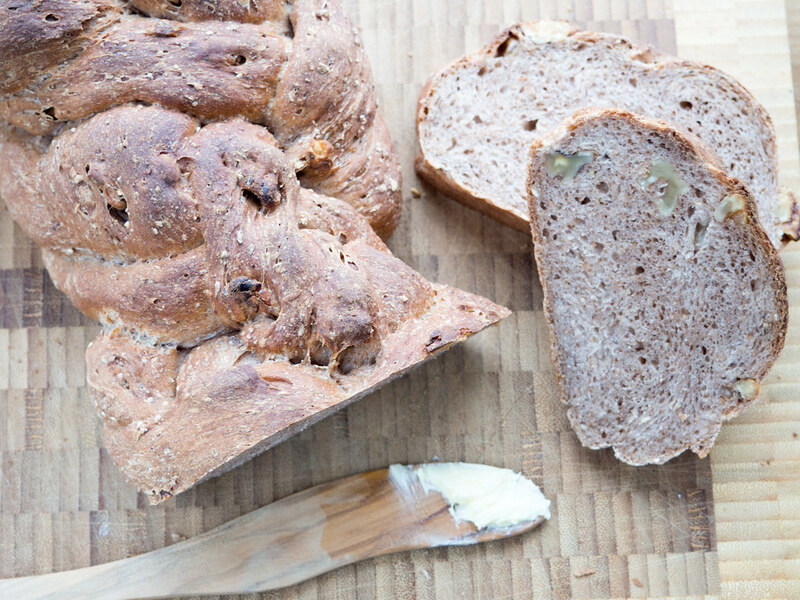 This recipe I am sharing here in this blog post, is a recipe for a great walnut bread. 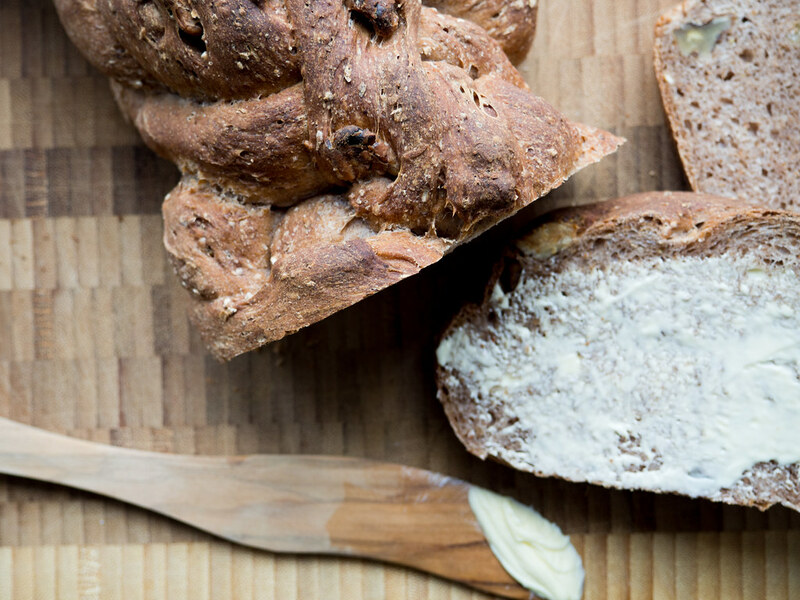 It is not that this walnut bread is really special or fancy in anyway – it is just that I think it is super delicious and tasteful. I think the great thing about this bread is that it has a little sweetness from honey, and together with the crisp walnuts and the great taste from the malt and whole grain flour, this is one of my all-time favorite. I personally like to serve this bread fresh together with some good cheese, preferably blue cheese or maybe together with some homemade jam. I have some simple and super delicious recipes for homemade jam posted here on my blog. 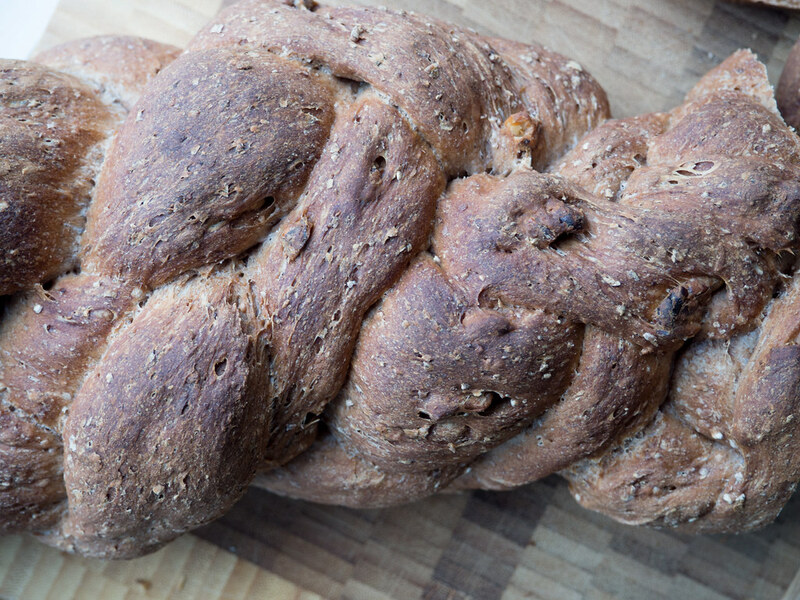 This walnut bread is partly made from whole grain flour and of cause walnuts; this makes it a nice and filling bread, which is a healthy alternative to regular white toast bread. The malt flour gives a wonderful color and a little, but delicious, burned flavor to the bread. Malt flour is made from germinated cereal grains, which has been dried using hot air. 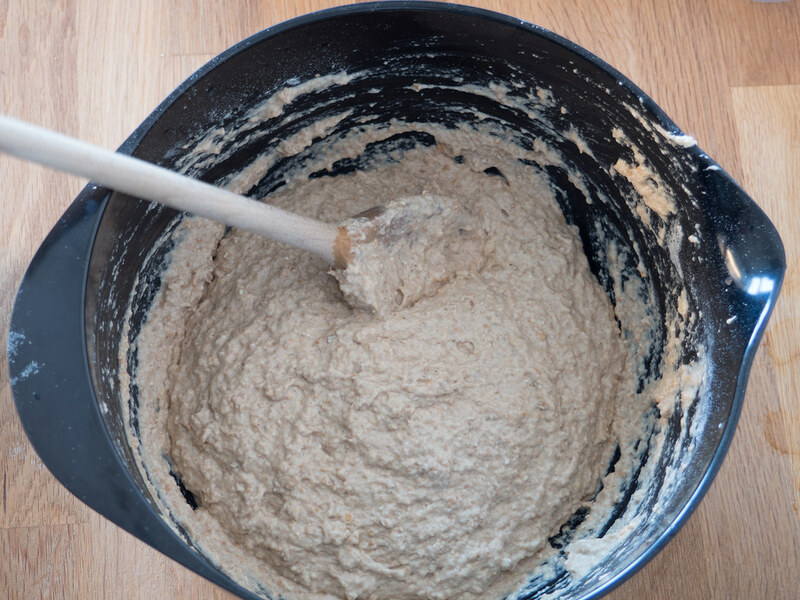 This process brings a fantastic flavor to the flour and is therefore perfect to use in bread. As said above, this bread is not special. However, this is probably not entirely true. Another thing, which maybe makes this walnut bread a little special, is the way it is shaped. Instead of just pouring the dough into a normal bread pan, I have made a twisted bread. In order to get this special shape of the bread requires several steps, which all are really easy to preform once you get the feeling of it. 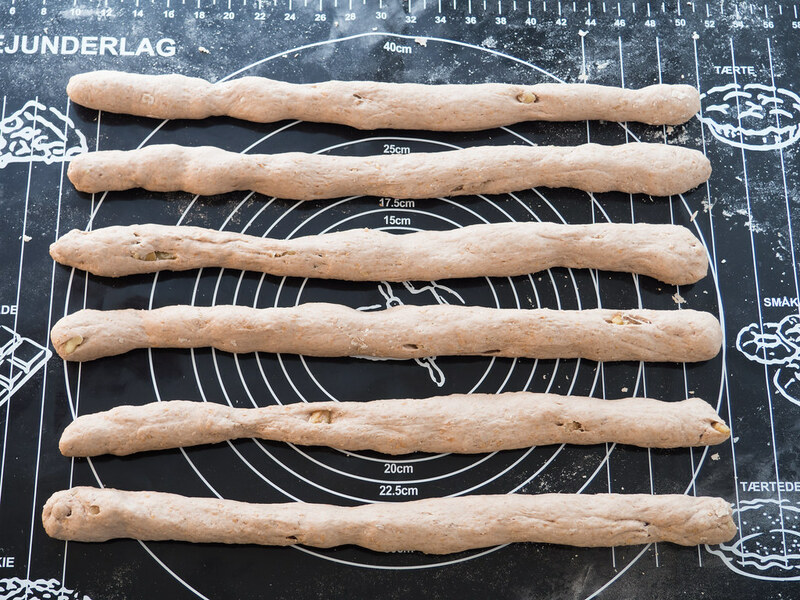 You start by dividing all the dough into six equally sized pieces and roll them into long ‘sausages’ about 25-30 cm (10 inch) long. This will approximately be the length of the baked bread. 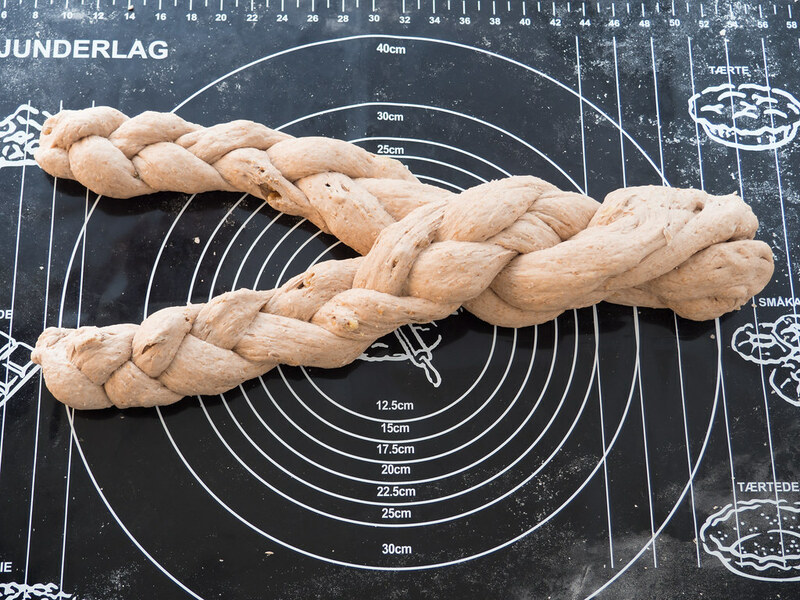 Then you make two braided breads using three of the ‘sausages’ for each. 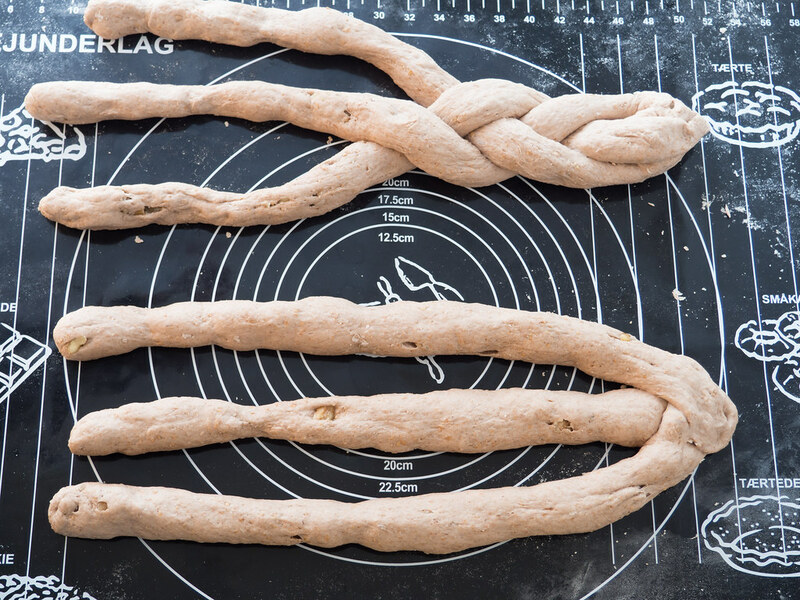 Finally, you twist the two braided breads together into one large bread. Fold the two ends underneath the bread. You can follow my picture guide below. The great thing about twisting the bread, as described above, is that it gets a beautiful top and a little but nice color variation on the inside. It is therefore a tasteful and beautiful bread, which is perfect to be served when having guests. 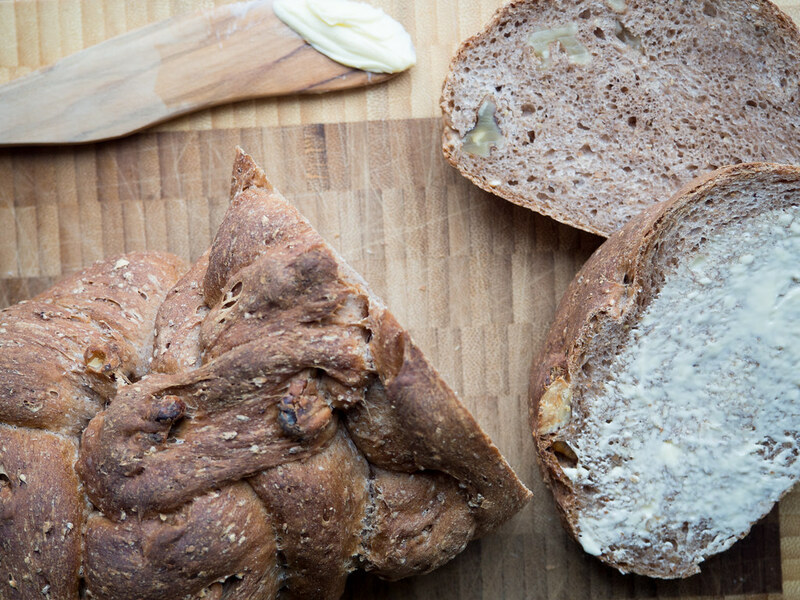 This bread is easy to make and it normally takes less than 15 minutes of working time. Of course, you have to account for the raising time, which is about 1.5 hours totally, and the baking time, which is about 30-35 minutes. You start by dissolving the fresh yeast in the lukewarm water. 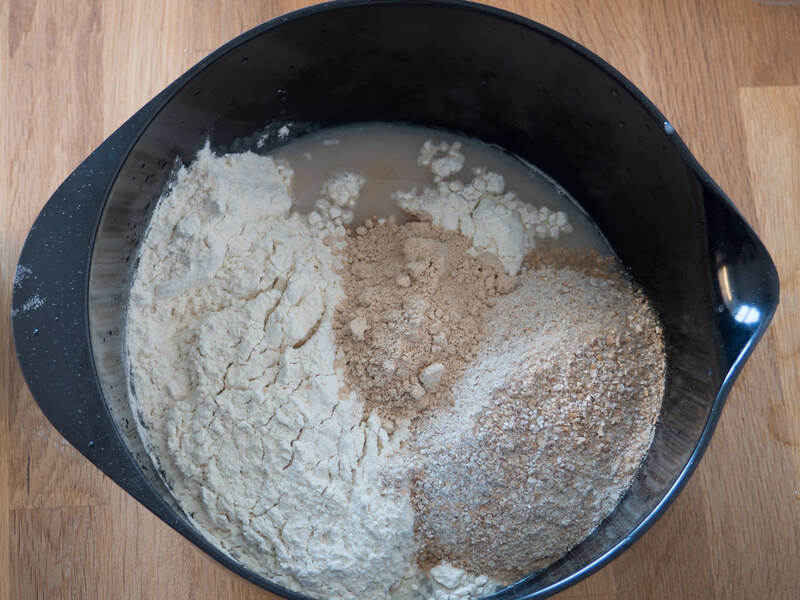 If you use dry yeast, you should use the instructions on the label – typically, you just mix the dry yeast with the flour. 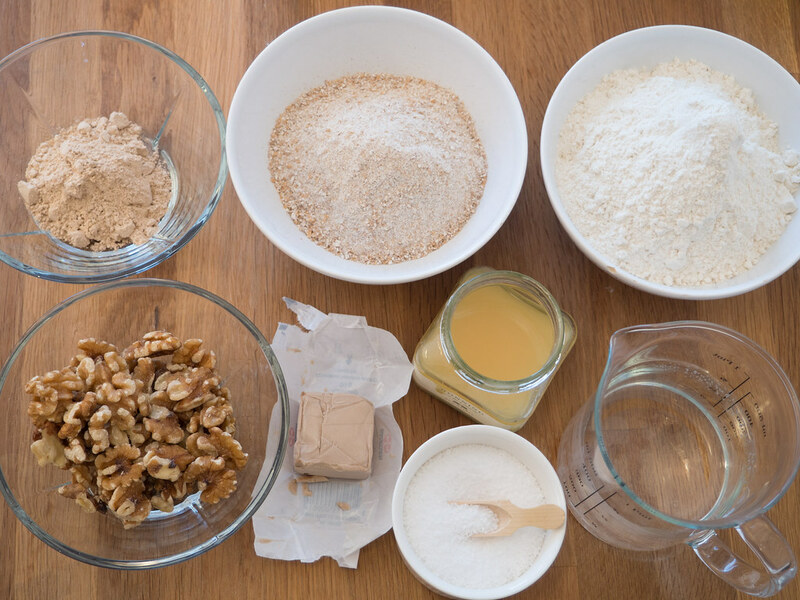 Then you add the honey, the three types of flour, walnuts and salt and knead/mix it all into a sticky dough. I normally uses my hands but a kitchen machine can be used with advantage. The kneading time is about 10 minutes. In the beginning, the dough seems too ‘wet’ but after the kneading time it should be nice and smooth. After the kneading; set the dough a side somewhere warm and let it rise for about one hour. 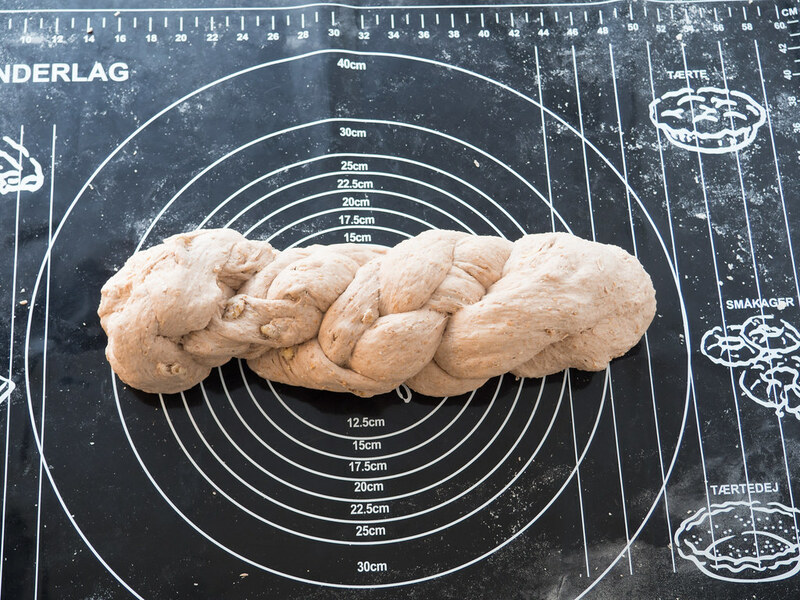 Divide the dough into six pieces and twist it as described in the section higher up on this page. Let the twisted bread rise for another 30 minutes. Preheat the oven to 200 C (400 F) and sprinkle a little water inside the hot oven before putting the bread inside. This water will evaporate and help making the bread nice on the outside. Bake the bread for about 30-35 minutes until it sounds hollow when knocking on the bottom side of the bread. 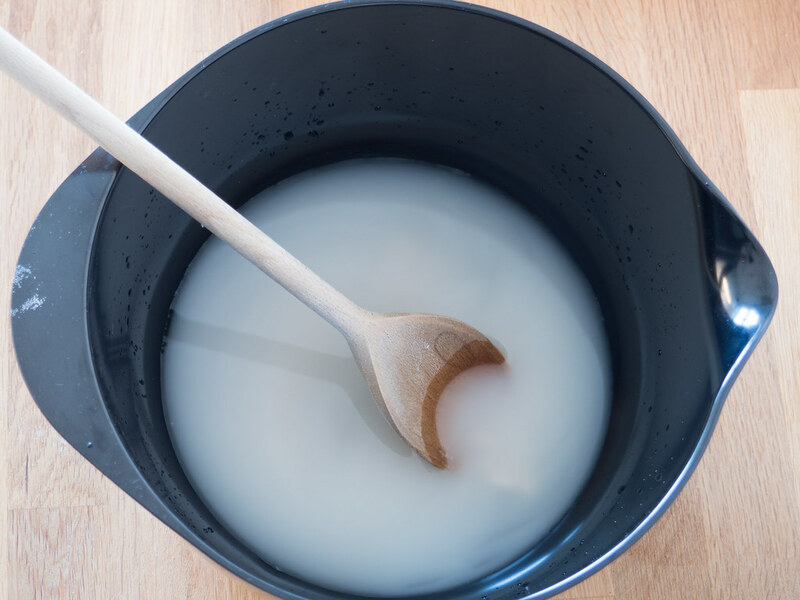 In a large bowl; dissolve the fresh yeast in the lukewarm water. If you are using dry yeast, add this together with the flour. Add the honey, the three types of flour and then stir/knead everything into a nice dough. 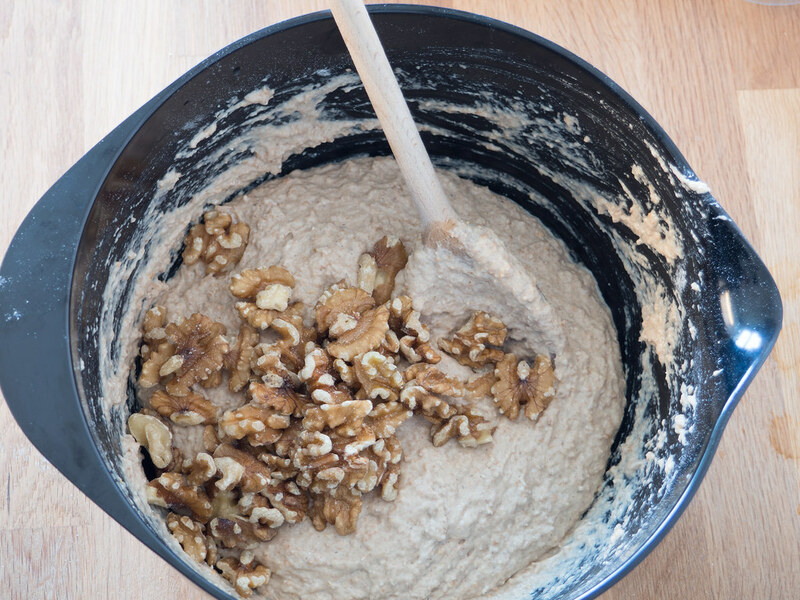 Add the chopped walnuts and the salt and knead everything into the dough. The kneading time is 5-10 minutes. Leave the kneaded dough in the bowl, cover it with a dishtowel and set it aside some place warm. 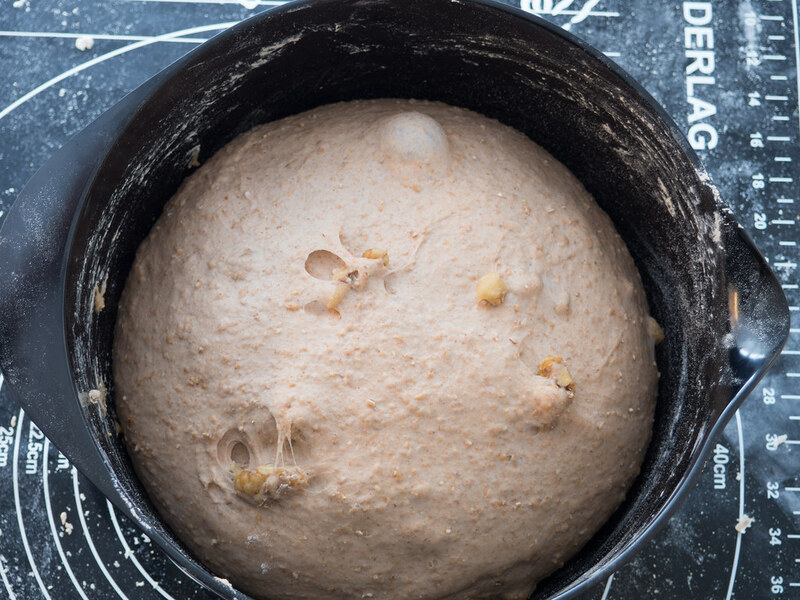 Let the dough rise for 60 minutes. 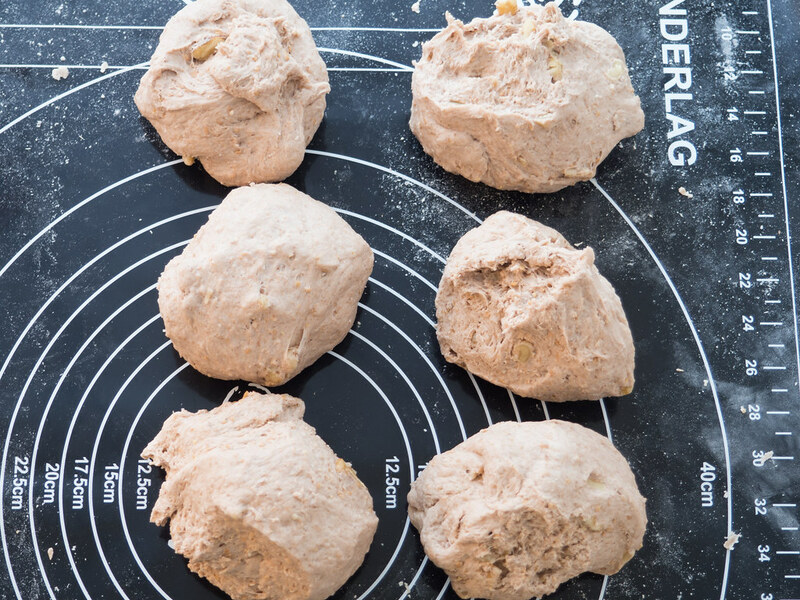 Divide the dough into six pieces and roll each pieces into long 'sausages'. Take three sausages and connect them in one end. Braid them, and connect them at the other end. Continue the same way with the next three sausages. 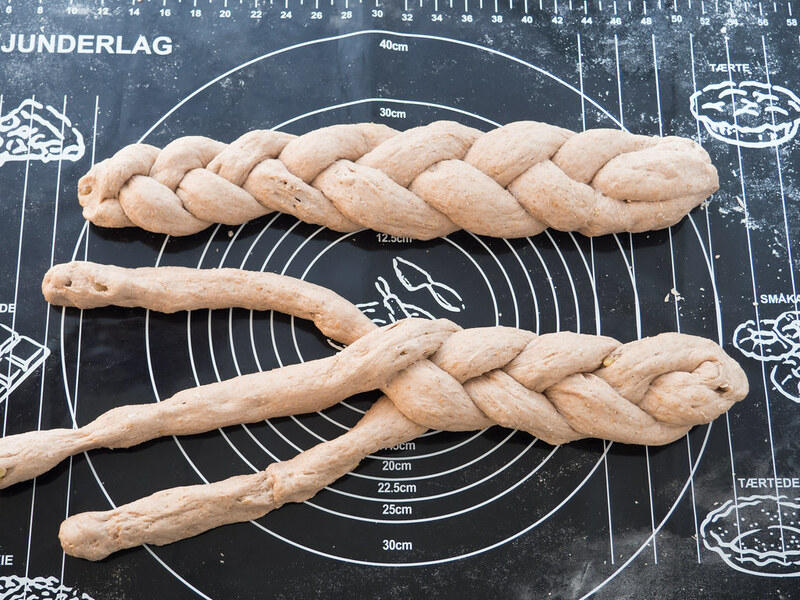 Now you twist the two braided breads into one single bread. 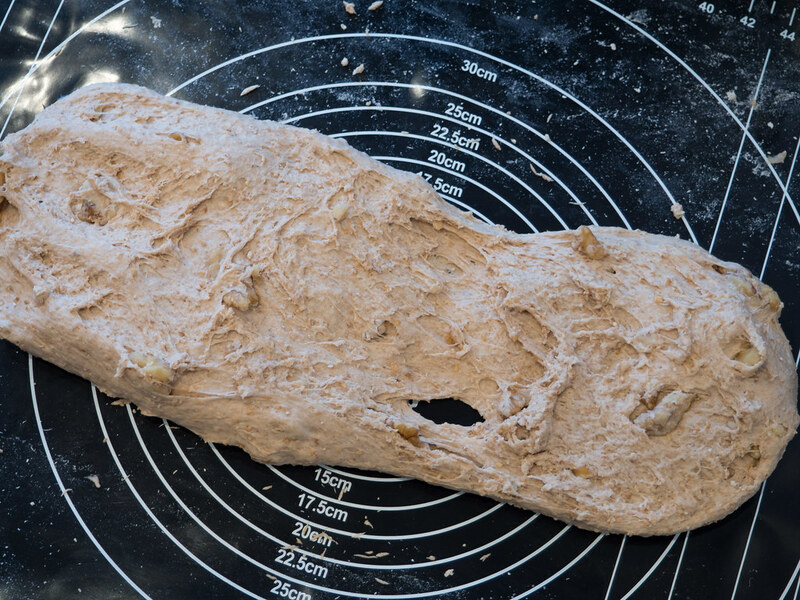 Fold the two ends under the bread. 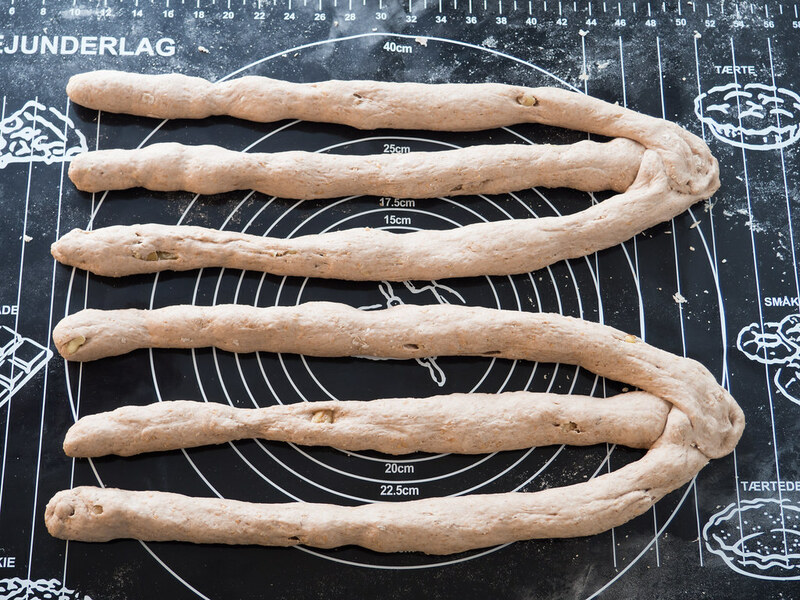 Place the twisted bread on a parchment paper covered oven plate. Cover it with a clean dishtowel and let it rise for another 30 minutes some place warm. 10. Spray a little cold water into the oven to create some water vapor. Now bake the bread for about 35 minutes. The bread is done when it sounds hollow when knocking at the bottom of it. Hi. Yes I actually thinks you can use Barley malt powder. I think it is almost the same. If you try I would love to hear about the result.